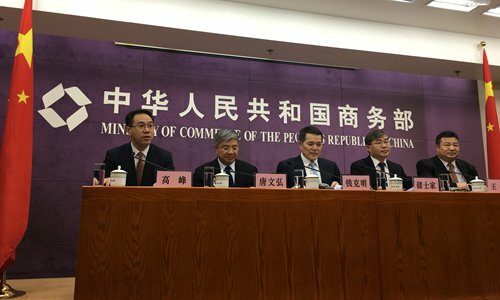 Some countries should stay open-minded and provide an open, transparent and convenient business climate for investors, including those from China, a Ministry of Commerce (MOFCOM) official urged on Tuesday. The official said that additional scrutiny of Chinese companies by some countries in the name of national security has had negative effects on the companies' investments abroad. Despite this increasing pressure, Vice Commerce Minister Qian Keming urged more competitive and creditworthy Chinese enterprises, including state-owned and private enterprises, to continue to invest abroad. "Based on market principles and international conventions, Chinese companies should continue foreign investment cooperation, develop and grow stronger. They should meanwhile create more jobs and revenue for host countries in order to achieve mutual benefits and win-win results," Qian said during the press conference. Amid a global downturn of transnational investment, which fell 19 percent in 2018, China's foreign investment rose 4.2 percent to $129.8 billion, according to the MOFCOM. It added that 405 merger and acquisition projects were completed with a total value of $70.26 billion. However, a growing number of foreign countries and regions have been on guard against Chinese investments. For instance, German state bank KfW agreed to take a 20 percent stake in high-voltage energy network operator 50Hertz on July 27 in 2018, fending off an offer from the State Grid Corp of China again, Reuters reported. Due to US suspicions over the world's biggest telecoms gear maker, Huawei Technologies, many of its allies have shown growing vigilance toward the company, analysts said. "If the US hadn't stepped in, many other countries would welcome Huawei to develop their local 5G technology sectors due to its attractive prices and quality. There shouldn't be too much wariness of the company," Bai Ming, deputy director of the MOFCOM's International Market Research Institute, told the Global Times on Tuesday. "A pressing concern for China is an alliance established by the US to target Chinese companies' overseas investments," said Song Guoyou, director of Fudan University's Center for Economic Diplomacy. Both analysts noted that Chinese enterprises should be prepared for more barriers while investing overseas, but they need to respond realistically. "Chinese companies should not lose sight of the bottom line for 'going out'," said Bai. If some countries impose unreasonable conditions, Chinese companies should stop investing in those countries. China has made great efforts to attract overseas capital with a series of policies to benefit foreign investors in the past year. In 2018, the actual use of foreign capital was 885.6 billion yuan ($130.7 billion) for China, up 0.9 percent. The overall tariff level was reduced to 7.5 percent in 2018 from 9.8 percent in 2017, aiming to attract more foreign capital. A shortened negative list for foreign investment was unveiled by the country in June. The list took effect on July 28, 2018, benefiting foreign investment in fields including finance, transportation, professional services, infrastructure, energy, resources and agriculture. An updated draft of the Foreign Investment Law was released in January and will be submitted for formal approval next month, as a move to showcase the country's resolution for further opening-up.